When it comes to paint colours, beauty is truly in the eye of the home buyer. A seller might see their cherry red kitchen as bold and bodacious, while a prospective buyer might think tacky and tasteless — before moving onto a less distracting property. 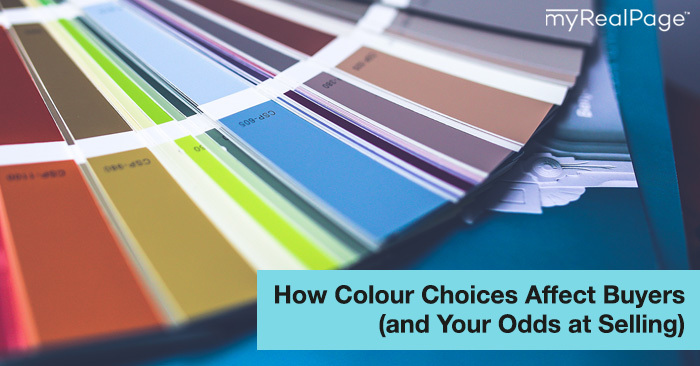 Colour choices, for interiors and exteriors, can impact the selling power of a home. Here’s what REALTORS® need to know about colour to avoid losing a sale. In a recent survey by Better Homes and Gardens, homeowners listed orange, black and purple as the three hues that they would be least likely to decorate with. Orange and purple are difficult to complement, black can make a room appear smaller and feel morose, and all three are loud. While these colours might be okay in small doses — such as a narrow black accent wall in an otherwise light-coloured room — their presence in larger areas might dissuade prospective buyers from taking a property seriously. If your client has a penchant for purple, politely suggest repainting in a neutral colour before listing. If several rooms in your client’s home need a paint job before the house is listed, look to the colours of the year for inspiration. For 2016, the trending palette — according to Benjamin Moore — includes pale but upbeat shades of blues, pinks, greens and grays. Using colours of the moment will help a home feel modern and contemporary. A coat of white paint can make any room look fresh and inviting. It’s especially transformative if a room’s features and furniture are outdated, and cannot be changed before the house is put on the market. In a kitchen with old appliances and antiquated wood cabinets, for example, white walls can help modernize the overall look. The only thing more likely to turn away a prospective buyer than ugly paint colours is surfaces that are in desperate need of any sort of paint. Chipped, peeling and faded walls, doors, mailboxes, windows and porches convey a sense of disarray and lack of upkeep, making buyers wonder if the whole house is in need of work. If your clients won’t budge on colour choice, then at least ensure that unkempt surfaces are treated to a new coat of paint. TORONTO, ONTARIO, May 3, 2017 – Toronto Real Estate Board President Larry Cerqua announced that Greater Toronto Area REALTORS® entered 33.6 per cent more new listings into TREB's MLS® System in April 2017, at 21,630, compared to the same month in 2016. New listings were up by double-digits for all low-rise home types, including detached and semi-detached houses and townhouses. New listings for condominium apartments were at the same level as last year. Total sales for the TREB market area as a whole amounted to 11,630 – down 3.2 per cent year-over-year. One issue underlying this decline was the fact that Easter fell in April in 2017 versus March in 2016, which resulted in fewer working days this year compared to last and, historically, most sales are entered into TREB's MLS® System on working days. "The fact that we experienced extremely strong growth in new listings in April means that buyers benefitted from considerably more choice in the marketplace. It is too early to tell whether the increase in new listings was simply due to households reacting to the strong double-digit price growth reported over the past year or if some of the increase was also a reaction to the Ontario government's recently announced Fair Housing Plan," said Mr. Cerqua. The MLS® Home Price Index (HPI) Composite Benchmark Price was up by 31.7 per cent yearover-year in April 2017. Similarly, the average selling price for all home types combined was up by 24.5 per cent to $920,791. "It was encouraging to see a very strong year-over-year increase in new listings. If new listings growth continues to outpace sales growth moving forward, we will start to see more balanced market conditions. It will likely take a number of months to unwind the substantial pent-up demand that has built over the past two years. Expect annual rates of price growth to remain well-above the rate of inflation as we move through the spring and summer months," said Jason Mercer, TREB's Director of Market Analysis.